Integral Ad Science, a global ad intelligence company, has released its Q1 2015 Media Quality Report. In this report, Integral is releasing the industry’s first in-app viewability benchmark and never-before-published international media quality metrics. After analysing 35 mobile in-app advertising campaigns over the quarter, measuring approximately one billion mobile in-app impressions, Integral found only 81 per cent of in-app ads were viewable. Although spending on mobile advertising campaigns continues to increase, movement has been slow in creating media quality standards specific to this area. Currently, most industry organisations assume that impressions served in-app are generally viewable. Integral’s industry-first mobile statistic shows the critical need to develop mobile standards. Integral is committed to working with the industry on this initiative. As a result of Integral opening its anti-fraud lab in February, the company has been able to expand and engage in deep study of fraud at a global level. 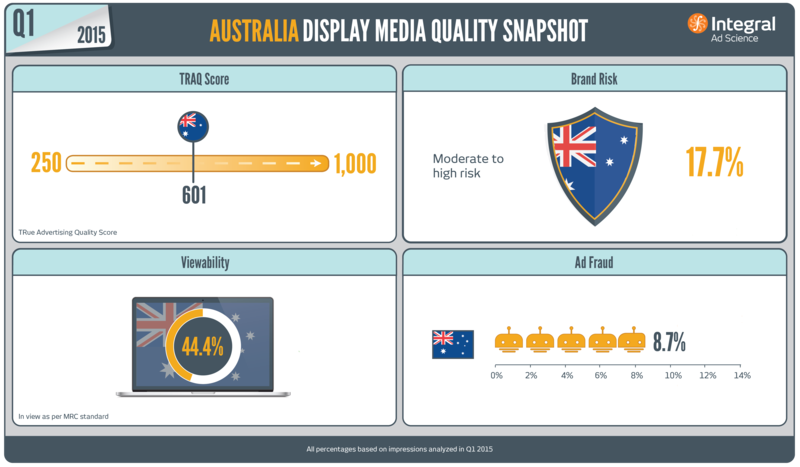 For the Q1 2015 Media Quality Report, Integral is excited to debut a full-suite of international media quality benchmarks including TRAQ, ad fraud, viewability and brand risk. Preliminary studies show that media quality is a global issue, with viewability levels ranging from 42.3 percent in view for Germany to 51.8 percent in view for the United Kingdom, and fraud levels ranging from 8.7 percent for Australia to 12.9 percent for the UK. Overall, media quality levels remained relatively constant from Q4 2014 to Q1 2015. Due to Integral’s acquisition of video analytics expert Veenome earlier this year, the Q1 report features new video engagement stats, such as 54.4 percent of video advertisements were found to be on autoplay.